At Eco GreenGrid, we are committed to environmental sustainability and providing environmentally friendly solutions through innovation and technology. Hence, the introduction of Eco GreenGrid product is an extension of that commitment. Not only is Eco GreenGrid made from 100% recycled plastic, it is also recyclable. So, by using our Eco GreenGrid product, you are helping to restrict the amount of new plastics being made. And most importantly, you are ensuring a high level of environmental credibility for your project. The “Heat Island Effect” is the phenomenon where urban and suburban temperatures are 1 to 6°C (2 to 10°F) hotter than surrounding rural areas. Heat islands form as cities replace natural land cover with pavement, buildings, and other infrastructure. The use of asphalt, concrete, paving and other impervious, man-made materials results in the absorption of the sun’s energy, rather then reflection. It’s this absorption which causes the surface and overall ambient temperatures to rise. Due to erosion, ground damage and maintenance costs, the use of natural land cover was previously “not an option” for medium to high traffic areas. 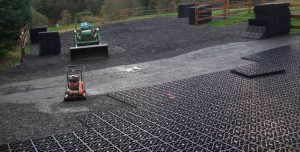 Eco GreenGrid has changed all this by enabling a reinforced, weatherproof, and porous natural land cover which can be used for parking lots, pathways, driveways and green roofs. A more porous natural land cover and less asphalt, concrete and paving results in less solar absorption, thus reducing the “Heat Island Effect”. For more information on the “Heat Island Effect” visit the United States EPA Heat Island Site or the International Council for Local Environmental Initiatives’ online resource for Urban Heat Islands Mitigation. An impervious surface is one which does not allow water to infiltrate to the soil layer. They are mainly man-made surfaces – rooftops, sidewalks, roads, and parking lots – covered by impenetrable materials such as asphalt, concrete, brick, and stone. Compacted soil is also highly impervious. Impervious surfaces repel water thus negatively impacting the environment by restricting groundwater recharge, generating large volumes of storm water, and degrading water quality. Impervious surfaces allow many types of pollutants, derived from a variety of sources, to accumulate upon them. As water hits an impervious surface, it is forced to travel downhill or “runoff”. Storm water runoff can pick up many of these pollutants and subsequently wash them into water bodies, severely degrading water quality. Water quality problems increase with increased imperviousness and intensity of land use. Eco GreenGrid prevents water quality degradation by enabling reinforced, porous surfaces to be used as an alternative to asphalt, concrete or paving. A porous surface allows water infiltration through the soil, which is the way underground water sources are replenished. Through water infiltration, soils and plants are able to filter out certain pollutants, thus maintaining water quality and being an environmentally friendly solution for your farm or facilities. Eco GreenGrid also prevents soil compaction, further decreasing storm water runoff.